(FEBRUARY 2006) Danielle "Dee" Carroll will add a "MRS" to her recently acquired MS title when she marries Michael T. Mahoney at the fifth annual Sheehan Family Wedding on Cape Cod in June. The Virgo nurse practitioner, a former world champion synchronized figure skater from Lexington, Mass., is marrying her brother Joe's best friend from Arlington Catholic High School. Michael, a nephew and godson of Sheehan World publisher Kathy Sheehan, didn't start dating Dee until New Year's Eve 2002, however. "Joe tried to keep me away from her all through high school," Michael said, "but we started hanging out more after Joe got married in 2002 and Dee and I were both in the wedding party." Dee, 25, and Michael, 27, have "huge" wedding plans, according to Michael. Officially, the couple has told friends and family that they plan a traditional, casual clam bake at the Dennis Yacht Club and that it will be a "cake walk" compared to Dee's rigorous nursing program. Privately, however, Michael says the wedding will involve "Sony's new technology and a Good Year Blimp. ... I'll just leave it at that." Dee, the daughter of William and Lorraine Carroll, received her MS degree from UMass last summer. She is the Emergency Department Nurse Educator at Saints Memorial Medical Center in Lowell, Mass., where she treats Michael whenever he is abducted by aliens. Michael is the oldest son of Patricia and Michael Mahoney and has a B.S. in criminal justice from Salem State College. 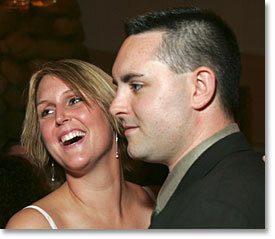 He currently works as the Loss Prevention Investigations Manager for Home Depot Boston-Metro West.